« Diary of A Layman #20 (Fall): Was Jesus A User? While there aren’t really any huge revelations in this film, I must unfortunately reveal a small one to describe the scene that made such an impression on me. It’s actually not even a revelation, since the audience has been aware all along of what finally gets revealed to the main character. Still, how the protagonist learns of this certain fact could be considered a bit of a spoiler. So, I have to recommend that you see the film before reading any further, or else the scene’s impact will be dampened. 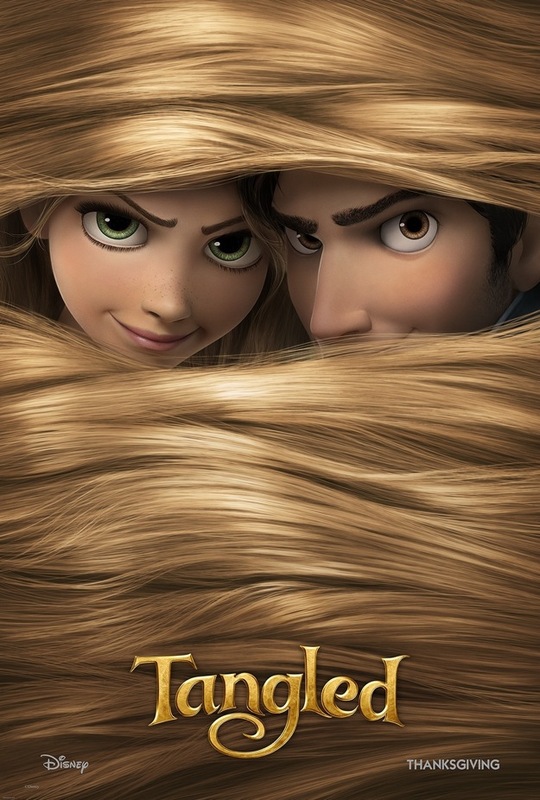 Based on the classic Rapunzel fairytale collected by The Brother’s Grimm, Tangled is the story of a young girl who is locked in a tower by Mother Gothel in order to take advantage of the girl’s magical hair. When Rapunzel sings an incantation, the hair’s healing properties restores the youth of the aging woman. 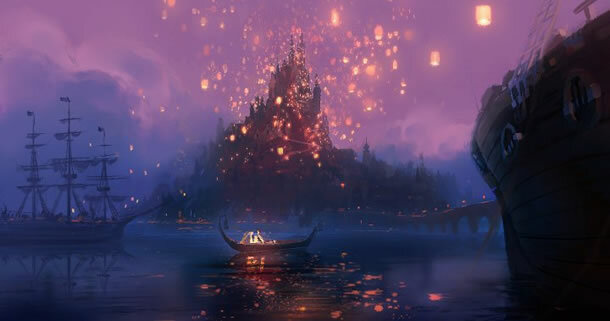 Trapped in the tower, Rapunzel leads a sheltered existence playing with her pet chameleon Pascal and painting a mural of floating lights that she sees outside her window every year on her birthday. Things remain the same, until one day, a charming thief named Flynn Ryder breaks into her tower. 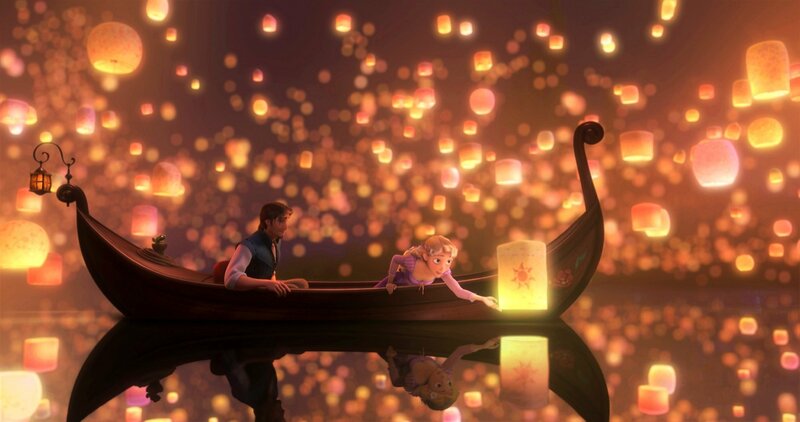 After being captured by her, he agrees to take her to the place where the floating lights come from. Once outside the tower, Rapunzel has the adventure of her life and discovers who she truly is. So, what’s the big deal? It’s all pretty much typical Disney-fare. In fact, this was another thing I liked about the film—that it returned to its classic Disney roots (pun intention not disclosed). While a 3-D version of this film was available, I preferred to watch the film through my mythology 4-D glasses instead, and I assure you, it made the movie that much better. 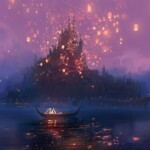 Rapunzel represents us, confined within the constraints of life and forced to make the best of it. Sure, there are all kinds of distractions to keep us occupied: chores, family obligations, playing dress-up with different costumes, but what Rapunzel really longs for, is to explore the outside world. Unfortunately, based on the stories of Mother Gothel (aka, society), she is too scared to take a leap of faith outside her tower and embrace her destiny. From her window, she can see these beautiful floating lamps that look like stars across the nighttime sky. They inspire her to create a mural on the wall of her room, and help her to mentally escape the dreariness of her existence. Only upon meeting the thief does she gain the courage to disobey her captor and go with her gut. And the two of them set out to find the origin of the lamps. The scene that really resonated with me happened near the end of the film when Rapunzel realizes who she really is. Staring at one of the murals she’s painted on her wall, she realizes that it has been embedded with a symbol that she’d subconsciously hidden for herself. She quickly realizes that the symbol is present throughout the mural and all the others she’s painted in her room. The symbol is that of a sun, and it is the symbol of the kingdom from where she was a princess until she was kidnapped as a baby. It is this very kingdom that releases floating lamps every year on her birthday in the hope that she will one day return to them. 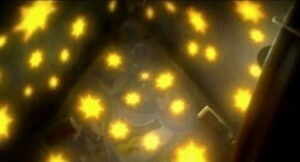 Rapunzel had remembered the symbol because it was at the center of a mobile that had been above her crib as an infant. Pretty deep for a Disney film, eh? Even deeper is how this scene relates to our lives. Many of us experience serendipitous occurrences, hints, or hidden messages on occasion. Up until recently, I have interpreted these as clues provided by the universe that we are meant to follow in order to fulfill our destiny. There has been no doubt for me that these clues exist, or that they contain messages meant for me. 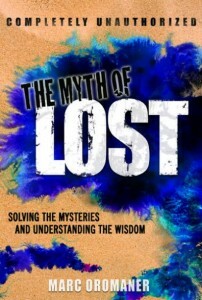 What I have been more unsure about however, is where the clues come from. If life is a videogame of sorts, could they be written into the program to help us on our journey? Or, perhaps spirit guides or the ghosts of loved ones deliver them to us. Lately however, I’ve been leaning more towards another theory: that the clues are being provided by us. We are subconsciously giving ourselves the clues that are sprinkled throughout our lives because our souls—or future versions of ourselves—already know the path we are meant to follow. Just as Rapunzel subconsciously knew that she was from the kingdom of the sun, we too know—on some level—that we really exist on a level beyond this illusionary realm. And every once in awhile, we give ourselves a clue to help us uncover the truth. For most of us, life is about dealing with all the BS of being stuck in the tower. And truth is, this is all just a distraction from what we are really supposed to be doing. The tower obstacle is put in our way so that we can grow ourselves to rise above it, or escape from it—whatever metaphor you prefer. The point of life then, is not to make more money, get a better job, a bigger home, a faster car, or a better body, it is to follow our bliss, which may or may not involve achieving any of these things. The other day, I finally got around to watching another animated film, Coraline. In this movie, the “life-as-illusion” theme is apparent in the story (as opposed to Tangled which requires some mythological interpretation). Lying in bed that night, a thought struck me that might have been influenced by the movie: if life is a game, what if the object is to leave it with the least amount of material attachments. The twist however, is that we must learn to be happy without any of them. Of course, this is by no means an original idea, it’s pretty much the theme of every major world religion. But I don’t think it’s just money and materialistic attachments that we must let go of, but any physical item or idea that we hold onto to help us get through life. I think it’s no accident that there are many shows out today about hoarding or picking, or pawning our personal sacred treasures. But what would happen if we were to let all of these things go? How many of them do we really need? As I begin to clean out my childhood home and my current apartment in anticipation of a move, I’ve been asking myself this question quite a bit. Why do we feel a need to hold onto these things? And it’s not just things either, it’s beliefs—religious or society-influenced. Personally, I believe that this “letting go” is a theme that we are being invited to embrace lately. And if we don’t embrace it ourselves, the world is going to do it for us—either with a crashed economy that keeps us from buying all the distractions we feel we need, an earthquake or tsunami that causes us to lose everything we own, an upheaval of the leaders of our nation, or a toppling of beliefs that we’ve held onto for so long. The word “apocalypse” actually means, “to reveal.” A revelation of what this world really is, who we really are and what we are really meant to do. The illusion is crumbling, the curtain is being pulled back, and the veil is lifting to show us that we’ve all just been trapped in a tower, and that there is an incredible world out there just waiting to be explored. All you have to do is to let go of your fears and explore them. Easier said then done, I know, but the universe does seem to be trying to help, and by universe, I mean us. We all subconsciously know what we are meant to do, so we are creating the events to help us do it and the clues to show us the path beyond all the ridiculous distractions and entanglements of modern life. Sometimes it was scrawled on the sidewalk in chalk, other times it was written in marker or paint on an old dirty mattress or some other garbage that was being “let go” of. Sometimes it was accompanied by an image of a walking fish (having escaped the confines of his bowl) and sometimes it was written in Spanish. Every time, however, it always seemed to be speaking directly to me, as it probably seems to every person who notices it. Today, as I jogged around the Central Park loop, I saw the message written at least one hundred times on the asphalt, so it got me curious as to who is writing them. Turns out that the messages were started by a New York City artist, James De La Vega, who painted a mural featuring the message along with a fish jumping out of its bowl on East 95th Street between 1st and 2nd Avenue—a mere eight blocks from my apartment. 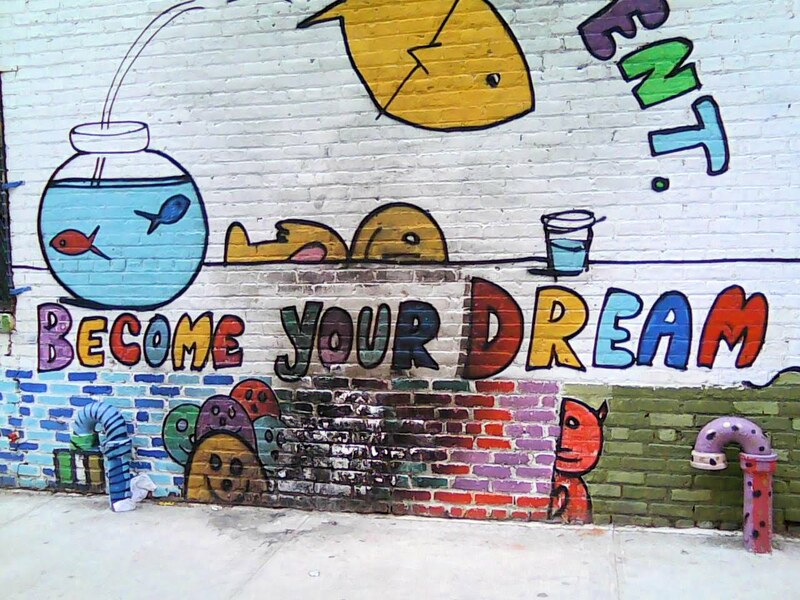 Now, considering the similarities between De La Vega’s mural, and Rapunzel’s mural and the idea of escaping from a fishbowl and escaping from a tower, you’d think that I had noticed this connection and planned on writing about it for this column. But the truth is, I had no idea that I was going to mention the De La Vega mural or the messages until I began writing this. It just kind of flowed out—from my subconscious self. The self that has been guiding me this whole time with many messages that have included: “Nothing Is Real,” “Follow Your Bliss,” and now “”Become Your Dream.” All have three words, the first with two syllables and the second and third with one each. Repeat it out loud and you get: da-da da da, which sounds like the opening of Beethoven’s Fifth Symphony. Is this rhythm some kind of chant to inspire artists and writers? Is it an incantation to awaken our inner powers? Is it soul-speak light language to channel spirit guide upgrades into our chakras? I dunno. Once again, all this is coming to me as I write. I have no idea where I’m going with this. Consciously anyway, but perhaps you do. It would seem that only a select few are meant to read this message. There’s a small portion who receive my columns to begin with, an even smaller portion who read them, and a teeny-tiny portion of those who have seen Tangled and read this particular one, or didn’t see it and decided to risk it anyway. I think the point is that we are coming to a stage in our evolution where the current confines of society no longer serve us. Letting go of everything we have ever known is very challenging indeed. But if we are not proactive about it, we are going to be pushed to experience these things whether we like it or not. 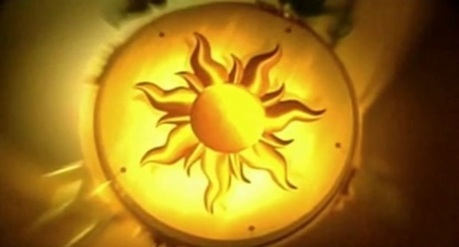 As the Reverend Michael Beckwith has said, “Pain pushes you until the vision pulls you.” And as James De La Vega and those inspired by him are encouraging, “Become Your Dream.” The dream of the sun symbol that Rapunzel subconsciously remembered from her youth translates mythologically into the idea that we are all children of the sun—beings of the light—and as this illusionary existence breaks down, we shouldn’t be afraid. We are only letting go of what no longer serves us. In the Hebrew Midrash, there is a section that talks about the panic that will ensue during the end of days where the Israelites (mythologically speaking, the spiritual people of this world) will hysterically cry, “Where will we come and go? Where will we come and go?” God comes to them and says, “Do not fear my children, do not fear. All that I have done I did only for you. Why are you afraid? The time for your Redemption has come!” I remember hearing this long ago and it still gives me the chills. To me, this section is describing what happens when we lose all our material possessions—all the things we have held onto physically, mentally, and emotionally. And once we no longer have them, we are in a panic and don’t know what to do. This will be a time of transition and like any drastic change, it will be scary as we try to adapt. But where will we come and go? To help us deal with the severity of the situation, my suggestion would be to go within. But this inner-world is something we have to work on now, and the more we build it up and let go of our creature comforts and imagined needs, the smoother the transition will be. We must all discover our inner passion, and live it. Doing so strengthens our connection to the purest part of our souls and allows us to see beyond the illusionary world we live in today. Mediate, do yoga, let go of societal paradigms and materialistic trappings. 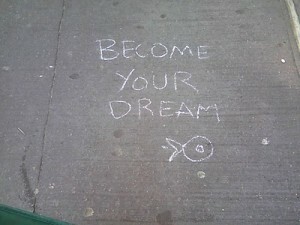 Become your dream. In addition to that message, “Follow Your Bliss,” and “Nothing Is Real,” there is another one that has been following me around since I was fifteen. 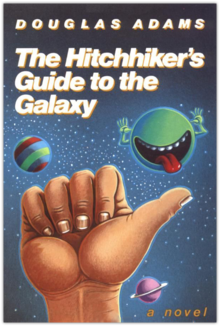 It is the number 42, and according the The Hitchhiker’s Guide to the Galaxy, it is supposedly the answer to everything. The number popped up again as Fox Mulder’s apartment number in The X-Files and again as one of the sequence of numbers in the TV show Lost. If, like all these other clues, I created this for the current version of my life experience (as you have created your clues for yours), then what could it mean? I’m not sure, but I will be 42 in the year 2013. Perhaps, in the year after 2012, we will finally have the answers we’ve been seeking. Or, perhaps it won’t be revealed until 2042…or, perhaps it’s all just the musings of a raving lunatic. I’ll leave it up to you to decide. But regardless of your choice, I still suggest you get inspired by art, escape your tower, and become your dream, just in case. Shortly after I posted this, “The Simpsons” had a new episode about hoarding (The cat lady is a hoarder). The other plot line was about compromising and learning to let go of the way you’ve always done things (Tommy Chong is tired of the old bits and Cheech finally opens up to experimenting with new ones from time to time). The clues are everywhere. Very insightful as usual but in a simulated reality letting going of material possessions would also include attachments to people. And changing beliefs is as impossible for most people as creating reality is for all of us. Yes, I think losing our need for other people to feel our own fulfillment is included in that. The process is built into the system since as we go through life, we do lose many people we are attached to. That doesn’t mean we don’t think about them or miss them, just that we no longer require them for our own self-worth. Still, I do think that the people in this system are real in the sense that there are actual ghosts in the machine. I do disagree though that changing beliefs for most people isn’t possible and that creating reality is equally impossible. I think we are doing both every day without even realizing it. Even consciously, I think many of us are changing our beliefs. Obviously, there will always be those who are stuck in their ways, but even they are being challenged by the way the world is moving. Much like the Vikings, I think the world is going to put us in a place where we will either have to change our beliefs, or die. I love the symbolism and you know I love movies and keeping my senses peeled for spiritual messages. Thanks for revealing your perceptions and I resonate with it! I’ll have to rent a copy of Tangled. 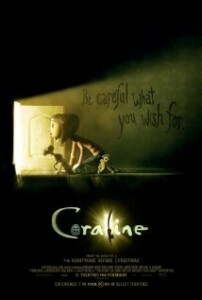 Coraline was great (and scary) at the same time. But I really needed to heed the spiritual messages in that film. Thanks for the light that you are Marc! Keep on sharing the light! i really love the idea that the cryptic messages ‘from the universe’ are generated by our own minds. this is an incredible post! everything made perfect sense to me as i read it, as if your words were simply a reminder of what i already knew. maybe i did already know it… but to me your connections are crystal clear. nicely done. Wow, I am really impressed Sarah! You have opened up to this way of thinking so tremendously from when I first met you! Perhaps my brother’s philosophies are rubbing off on you? That is true synergy, since I think your views have shaped his perspectives as well! He has become much more conscious of the foods he eats and the effects of them. Together you are turning into spiritual-scientific juggernauts! I hope you continue to get excited about this perspective, and begin to see how it is within the range of science, it just hasn’t been completely accepted yet. Happy that I could serve as a reminder to what you’ve known all along! Welcome back Miami! And thanks for letting your dad and brother know about the columns. Season’s 4-6 are all posted so they can follow along episode by episode if they wish. As for the sign, nice catch! (Maybe you should’ve pulled it out of the garbage ha ha! Or at least put it in the recycle bin.) The more signs you notice, the more you’ll get. Glad my writing was able to help! I bet you say that to all the blogs.